The U.S. Men’s Under-18 Team will begin its quest for a fourth consecutive gold medal at the 2012 IIHF World Under-18 Championship Thursday. If Team USA hopes to accomplish that feat, the 13 forwards on the squad are going to have to combine for a spirited offensive effort. There is some concern about this team’s ability to score consistently after a less-than-stellar offensive output at the Under-18 Five Nations Tournament in February. Compounding offensive concerns is Stefan Matteau being ruled ineligible to play for Team USA at the tournament by the IIHF. More on that later in this post. The loss of Matteau, who was replaced by 1995-born Anthony Louis on the roster, will hurt, but it also gives players like Nic Kerdiles, Ryan Hartman and Riley Barber a more featured scoring role. It will also require other players to step up to fill the void. Needless to say, it’s going to require all four lines firing throughout the tournament to put together another gold-medal run. Coming up after the jump, a look at all 13 forwards responsible for Team USA’s road to a fourth consecutive gold medal. J.T. Compher — Northbrook, Ill. — One of two 1995-born forwards to make the team, Compher sure doesn’t look like an under-ager on the ice. He’s strong on his skates and nasty in the corners. Not only that, but Compher has good finish around the net. Since getting called up to the U18 squad from the NTDP’s U17 team, Compher posted six goals and two assists in 11 games. He gives energy along with offensive spark. Draft eligible in 2013. Stefan Matteau being ruled ineligible has been confusing for most, and especially disappointing for Matteau himself and his team. Days before leaving, the team was informed, after an appeal process, that Matteau would not qualify for competition with the U.S. This ruling by the IIHF is potentially precedent setting, as it has affected neither Canada nor the U.S. previously. It is rather common for dual citizens to compete for the U.S. or Canada and this rule could potentially impact future international tournaments at the Under-18 and Under-20 levels. b) if the country of his choice is one to which the player has transferred then he must have had an IIHF international transfer card approved and dated by the IIHF at least two years prior to his proposed participation. When a player wishes to establish his eligibility under subsections c) or e) or f) or g) the member national association for which he wishes to play must submit an application to the IIHF together with all relating evidence at the latest four weeks before the competition or game in which the player wishes to play. The General Secretary is responsible for investigating the application and confirming the player’s eligibility to play for the country concerned. Notwithstanding the above, the decision of the General Secretary is not conclusive proof of the eligibility of the player to play for the country concerned. The part that directly relates to Matteau is part A. The wording is a bit confusing and also a little vague. 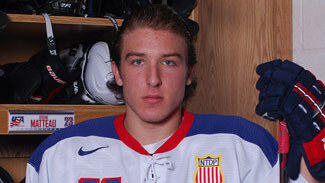 Matteau, born in the United States, played for the NTDP for the last two seasons, representing the country both domestically and in international tournaments like Four Nations Cups. Though he was based in Ann Arbor for two seasons, he did not live in Ann Arbor for two consecutive years, as in 24 months. However, he did play in the national competitions of his country during which games were being played in that two years period. Matteau was born in the United States and lived in the country until age 9. After his father Stephane retired from the NHL, the family moved back to Quebec. Matteau played within the Canadian youth hockey system after the move and later went off to Notre Dame in Saskatchewan for his age 15 season. Further complicating the issue is that several players in very similar situations to Matteau’s have been allowed to play in this tournament. Colin Wilson, Brandon Maxwell and Jason Bailey come to mind as players who were dual citizens that lived in Canada immediately prior to joining the NTDP. Why Matteau has been singled out is uncertain. The rule is open to interpretation, but why would it be interpreted differently now with multiple instances setting a different precedent? This is the question the IIHF may have to address at some point. What makes the decision disappointing is that Matteau, an American citizen by the laws of the United States, is being denied the opportunity to represent the country of his birth. As an American citizen, he should have the option to represent his country. Coming up later today, a look at Team USA’s defensemen and goaltenders. This entry was posted in American Prospects, Junior Hockey, NHL Draft, NTDP, U.S. National Teams, Uncategorized, World U18 Championship. Bookmark the permalink. Are you able to explain Galchenyuk’s eligibility? I seen his name on the roster at the IIHF website. Is he in the mix? Would Matteau be able to play for the U20 team? Galchenyuk’s eligibility is even more complicated than Matteau’s, but the odds are he would not be eligible. I believe this will continue to be contested by USA Hockey. He was listed on USA Hockey’s initial report, but so was Matteau. After the ruling on Matteau, it pretty much ruled out Galchenyuk too. If this is not resolved before the World Junior Championship, it is likely neither would be eligible to play for the U.S. It’s very, very complicated and confusing, if you ask me.